So as it says, you need a Host.Config.Storage permission to run this. There are a variety of roles that provide for this that are built in to vCenter (administrator for instance), but if you want to get granular you can create your own user role to do just this. 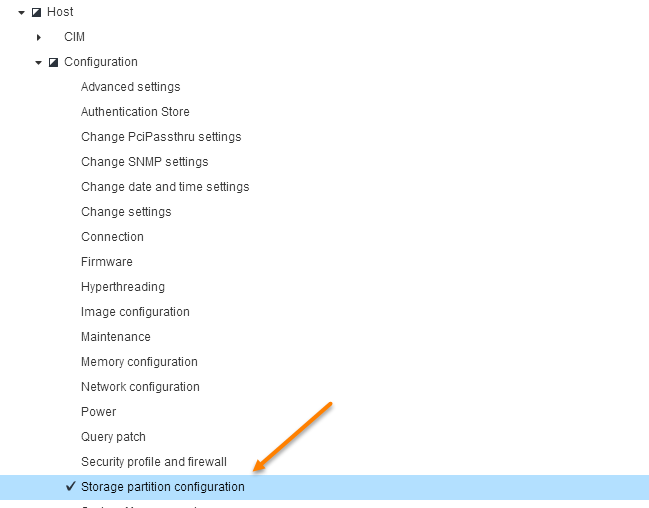 The permission that is required as seen in the vSphere Web Client is Host -> Configuration -> Storage partition configuration. Assign this permission and only this permission to a new custom role for the bare minimum. Choose a cluster object or vCenter object (or any higher-level object in the inventory in which the desired host(s) are subservient to) and assign it to that object and let the children inherit the permission. 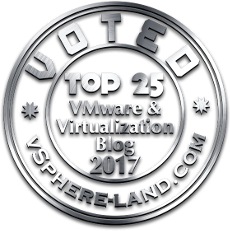 This option will grant UNMAP access to your user for all of the hosts below that object in your vCenter inventory. 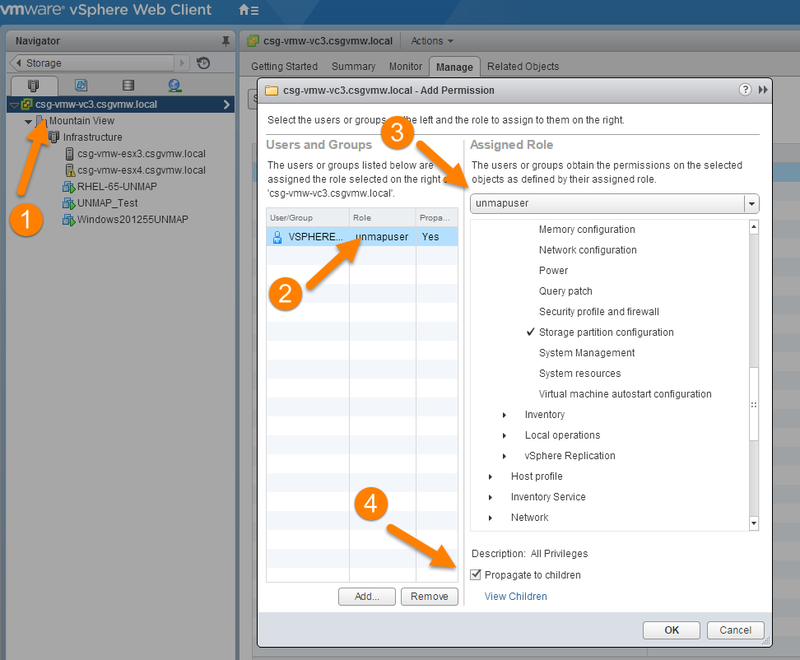 Below I am assigning the user with my custom role to the vCenter object and propagating it down. One thing to note is that you do not need any actual permissions on the datastore, or really any child-object of the ESXi host. UNMAP will work with simply a Host.Config.Storage permission on the top level of the ESXi host with zero propagation. So basically it looks like if a user has this permission on a host, it can UNMAP any volume (that is of course actually presented to that host) even if they explicitly are given the “no access” permission on the datastore. Thanks a lot for this Cody. I think this should set us just right. After 1 last question of course :). I planned on running this weekly. Would you recommend a shorter/longer gap between runs, or does it vary? We’re sitting at about 54-59% on both of our arrays. Maybe I’ll go with bi-weekly then. Thanks again Cody! Thanks for the role. We went ahead and tried it, looks good. However, we are coming across something else. Any idea what we’re missing? Man we are really struggling. When we run the script against our test VCenter, it sees the volumes, it does its thing. When we run it against prod, literally ONLY changing the $vcenter line, it finds 0 VMFS volumes. The role was created and given rights to the specific cluster. If we login to the VCenter GUI as that user, he sees his hosts, but, on the config tab? no datastores. Baffled. You want to do a GTM and we can work through this? I am free noon at later pacific time. Sure Cody, I’d appreciate it. 3PM Eastern sounds good to me.